Houston is a big city, but it shuts down pretty early. I arrived at IAH at 11 pm and was not out of the concourse until half-past. We hopped on 59/69 and by downtown decided we needed some tacos. The dining room of this outpost of the fast food restaurant is open until midnight, with the drive-thru open 24 hours. When it's not too hot, there's a nice patio out front where you can watch Houston bustle by. 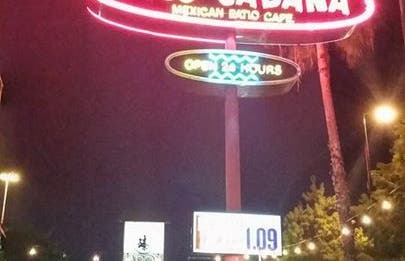 Taco Cabana used to be famous for its extensive $1 and $2 tacos and burritos, but now it mostly sells "meals", which offer more food but are not nearly as fun. My go-to the past few years has been the street tacos, which are often on sale for $5.99. I wasn't disappointed! they're were several options I wanted to try. they had many options for sauces and add-ons. process are reasonable as well! the place was clean.